Appearance: Very dark purple, nearly black. Nose: Cherry jam, hardwood smoke, blueberry juice, blackberry. Palate: Slightly chewy but not overly tannic. Toasted oak and cherry again. Finish: Big cherry in the finish. Parting words: Barbera is a long suffering grape. Given a bland or worse treatment in its Piedmontese homeland for many years, it was involved in a deadly contamination scandal in the 1980s when thirty people died from drinking Barbera containing a deadly amount of methyl alcohol. As one can imagine, when a wine kills a bunch of people consumers tend to shy away from it for a while. Barbera can be delicious when done right and this is a great example. It’s bold and a little spicy but still very fruity and easy to enjoy with or without food. We had it with medium rare rump roast and roasted rutabagas (a.k.a. swedes) and it did well. 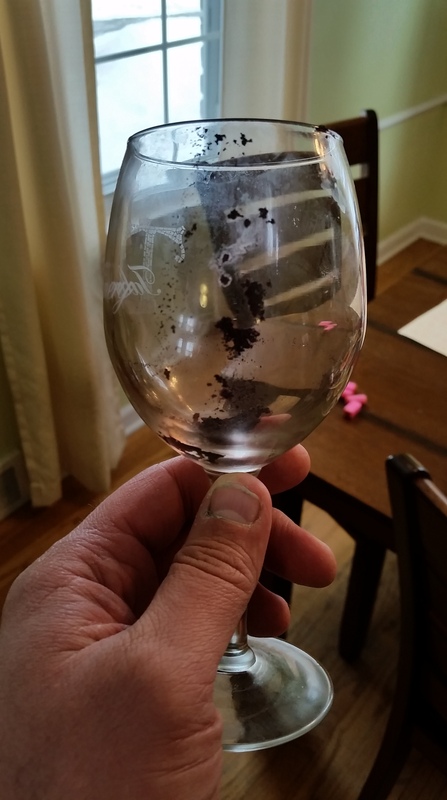 It also threw a crazy amount of sediment into the glass, as you can see. Batasiolo Barbera D’Alba 2007 is recommended. I like Barbera a lot and I will try to find the Batasiolo one for sure! Definately worth seeking out, especially if you can find one with some age. Thanks for commenting & following!